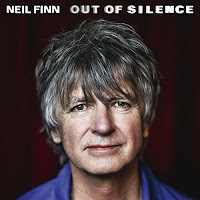 During his prime, I would say that Neil Finn was one of the greatest songwriters out there. Most of that work was with Crowded House, but he had good solo stuff and also with his pairing with the Finn Brothers (his brother, Tim). In the later years, there wasn't a huge difference between his solo and collaborative work. Crowded House had / has become a semi-revolving door, with the only constant being Finn. So much of his work though just sticks with me. Finn's solo work has been spotty at best. But in this topsy-turvy world of music, it has to be frustrating to know where a veteran stands. Or how. Music isn't made, played or released the way it once was. Radio, well, I mean, it exists, but does it? I won't say these days you need a gimmick, but maybe you do to get your records noticed amongst the lack-of-talent tweens and horrible rappers. I think Finn had a novel idea of getting some publicity, but I don't think it generates sales. Out of Silence was recorded live in the studio over a period of Fridays........on Facebook. You could watch live while he and his assembled band and Kiwi vocalists cut the track(s) real time. I missed every single one. But I like the results. The songs are low-key and piano heavy, but that's all good, though a song like "Second Nature" picks up the pace and does a good job of it. I like "More Than One of You" and really love "Chameleon Days"
Some aren't bad, but I won't say they're good either. "Widow's Peak" falls into this category. There is a danger in the track list of some songs sounding too alike one right after the other. Finn is in good voice. I like the arrangements and the lyrics. It might be his best solo disk. It doesn't quite measure up to one of the Finn Bros records or some of the stellar Crowded House disks, but Out of Silence is a solid release.